It's Elevation Beer Company's 1st Anniversary here in Colorado and they have put out a special beer just for the occasion. This review covers their Elevation Beer Company 7437 Double India Pale Ale - 1st Anniversary Ale. 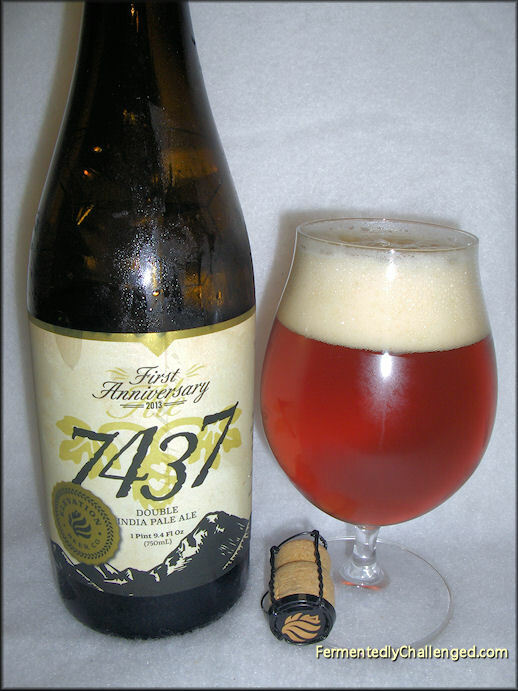 The beer was named after the elevation at their brewery in Poncha Springs, Colorado - 7437 feet above sea level. They wanted to build a beer as big as their elevation for this one. One of the benefits of being a beer blogger is that I occasionally receive complimentary bottles from a brewery. Elevation Beer Company has been gracious enough to send me several different bottles of their beers over the last year. I am more than happy to receive one of their beers as I don't often see much of their bottles at my favorite local stores. Elevation Beer Company used a wide variety of hops and malt in this big 9.0% ABV 100 IBU Double India Pale Ale (DIPA). They mixed in a heaping dose of Simcoe, Galena, Falconers Flight and Chinook hops and blended it with Two Row, Crystal, Carared and Carafoam malts. The label stated up front: "Do not age!" as they wanted people to taste this beer as fresh as possible so as to not lose any of the hop intensity. I appreciate a label that lists ingredients and all the stats of a beer. They packaged this beer in a big 750ml corked-n-caged bottle. Appearance: Elevation's 7437 poured out a dark golden color with some reddish highlights. The head was big and billowy and was off-white in color. As the head melted it left a noticeable sticky lacing along the sides of the glass. Peering through the glass, the beer itself had great clarity. No haze or sediment was visible in the first pouring. I loved the coloring and look of this beer. Aroma: With 4 different blends of hops and 4 different malts, this beer had a lot of aroma. 7437 had wonderful citrus (grapefruit-like) and pine aromas mixed in with a scent of sweet caramel malt. This had a BIG hop aroma to it as I would expect a double IPA to have. The hops smelled powerful and fresh. This beer had only been in the bottle for a couple weeks and I could tell. Despite it being a big 9% ABV, I could only pick up a trace of alcohol in the nose. Hops was the predominant feature here and the blend Elevation chose seemed to work well in this aroma. Taste: One of the nice features of this beer was that upon first sip it felt like a wonderful balance of hops and malt. This beer wasn't overly bitter, yet I knew the hops played a big part of this flavor. I could almost taste some grapefruit and caramel in this beer. This beer was medium bodied and had a lot of good sticky resin sensation. This beer drank very smooth for a double IPA and had an underlying sweetness to balance the big IBU count. Yes, this is a big hoppy beer, but even on the cold side it had plenty of malt sweetness left in it. The bitterness and sweet lasted the entire sip start to finish. It wasn't as dry as I thought it would feel, rather it left my mouth moist and watering. This 1st Anniversary beer is certainly one to remember. I certainly hope they decide to make this beer again and not just as their 1st anniversary beer. 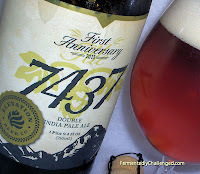 Overall: I was thoroughly impressed with this 7437 Double India Pale Ale. From every aspect, this was a well made beer. It had a great taste, was easy to handle for a big beer, had a great hop nose and seemed to accentuate both the hop and the malt in the brew. It's a Double IPA that I would heartily recommend for any hop lover. I would tend to rank this up near the top of all double IPAs that I've had in the last couple of years. Elevation Beer Company is certainly making a good name for themselves in this first year of business. I hope they continue to put out top quality beers like 7437 Double IPA. Can't wait to see what they do for their 2nd anniversary! Disclosure: This beer was given to be as a free sample bottle directly from the brewery, however I was not paid nor asked to give this review. - Elevation Beer Company False Summit Quadrupel Ale review.